Eli Manning and the New York Giants are almost certainly headed back to the playoffs for the first time since they won the Super Bowl after the 2011 season. 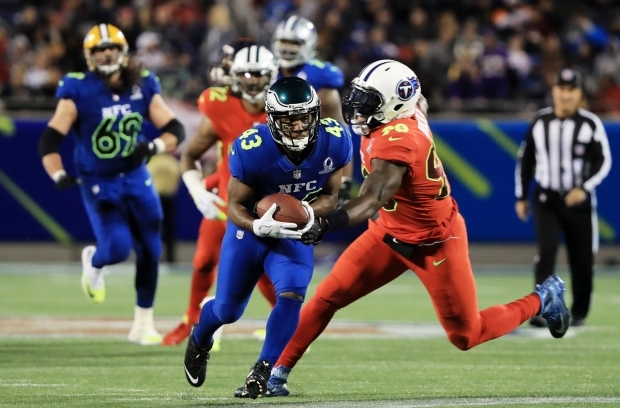 But to get back there as division champs, they’ll probably need to win out, starting with a division matchup against the Philadelphia Eagles on Thursday Night Football. To get that, the Giants will need to rely on the same short passing game and stout run defense that put the game in the hands of Cowboys rookie quarterback Ezekiel Elliott in two wins over Dallas this season — their rival’s only two losses this season. Eli Manning worked the dink-and-dunk to perfection in Sunday’s win over the Lions, and against Philadelphia’s stronger pass rush, more of the same is likely. Meanwhile, the last-place Eagles will just be trying to get quarterback Carson Wentz turned around. The rookie fell almost completely apart against pressure Sunday and will not get much of a break against Olivier Vernon and Jason Pierre-Paul. The Giants also may be finding a running game as the playoffs approach. Rookie running back Paul Perkins ran for a season-high 56 yards on 11 carries against the Lions. If New York can find balance after relying on Manning and the passing game for 23 of their 28 offensive TDs this year, they could be a threat in the playoffs whether they make it as division champs or as a wild card. New York Giants WR Sterling Shepard has six TDs this season, second only to Odell Beckham and more than the Giants have scored in total on the ground. New York Giants DB Dominique Rodgers-Cromartie got a lot added to his plate Sunday when Janoris Jenkins was hurt. If Jenkins can’t play Thursday night, he’ll be just as busy against the Eagles. Eagles C Jason Kelce helped lead the way as the Eagles paved the Ravens for 169 yards and rushing and 2 TDs in a 27-26 loss that was nevertheless their fifth straight. Eagles TE Zach Ertz is doing a lot of the heavy lifting in the Eagles’ passing game lately, including on Sunday when he led the Eagles with 80 yards on his six catches (no one else had more than 27 yards receiving).